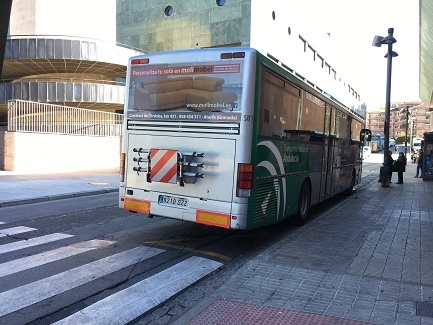 MUNICIPAL ORDINANCE REGULATING RIGHTS AND DUTIES OF URBAN PUBLIC TRANSPORT USERS IN GRANADA. k) Carry objects or hand packages that due to its size, kind, shape and quality do not cause inconveniences or danger to other users, and effective occupation and maximum of vehicle allows it. As a general rule, there will be allowed one object of package whose measures does not exceeding 70 cm. x 45 cm. x 25 cm. Folded bicycles in their carrying bags will be allowed whenever does not exceed indicated measures. 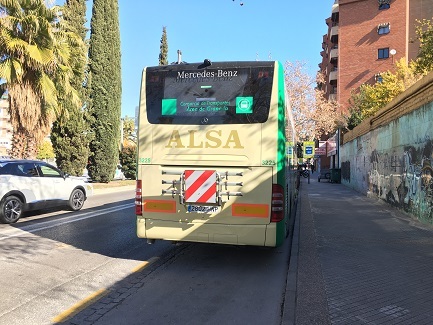 Attending to the technical posibilities of buses and safety of passengers, could be stablished itineraries, schedules and conditions that allow to carry bicycles. Bicycle users can circulated through bus-taxi lanes and access control points in Granada. It is allowed the access with bicycle to all stations and stops on surface of Line 1 of Light Rail of Granada. Check all consideratios for the correct use of the installations and avoid inconveniences for the rest of users.